Here it is – our 10th grade curriculum. I decided to take the easy way out this year, and hopefully eliminate some costs and headaches, by deciding to do most of my son’s schooling using Abeka Academy. We won’t actually be reporting to them, but we get the DVDs for each class, and have paid for all the necessary books to go with them. In all honesty, I don’t mind using an eclectic method and choosing things from here and there, as that’s what I’ve done for my son’s schooling every year up until now, but he doesn’t seem motivated enough to get what he needs to get by just reading books and using various other resources. I felt something more structured was needed this year, and this seemed the most cost effective with minimal effort on my part. Well, here is our 9th grade curriculum. It’s taken awhile for everything to fall into place, but other than an elective, I finally have it all figured out. I have all our books on hand now, and just have to determine what we need for the science lab kit. Yay! Because we start school in July, and the class doesn’t begin until the end of August, my son will also use Vocabulary Lists obtained from Abeka’s Vocabulary, Spelling, Poetry III and read a couple of other books, including Adoniram Judson: Bound for Birma by Janet and Geoff Benge, for those first couple of months, and final month, of the year. Well, it’s that time again. If you haven’t started your school year already, then chances are you’ll be starting pretty soon. Have you got all your curriculum yet? Possibly so, but I’m sure there are those out there who want to homeschool and are struggling. You’ve either found a way to make do, or it’s possible you’ve delayed getting your books in hopes of being able to afford what you need later. This is where The Book Samaritan comes in. The Book Samaritan is a non-profit organization that runs out of Pawhuska, Oklahoma. It helps provide homeschooling materials to those financially unable to get what they need to homeschool their children. If you’re in need of materials, you can send a letter to this organization, along with your children’s grade levels, and they’ll help you out. If you have specific curriculum requests, you can include those as well. They can’t always fulfill the specific curriculum requests, but they’ll do what they can to get you what your children need for the school year. You’re probably asking, “But what’s the catch?” It’s simple really. When you’re finished with the materials, they don’t want you selling them. You are to either pass them on to other homeschoolers who can use them, or send them back to The Book Samaritan, so they can be used by other homeschooling families in need. That’s it! If finances are what stand between you and your ability to homeschool, then this is a simple solution. Maybe you’re a homeschooling family that doesn’t need help with materials. Maybe you have old curriculum and learning supplies laying around. Well, guess what? You can HELP The Book Samaritan. And of course, monetary donations are accepted as well. These funds are used to provide families with materials the organization doesn’t already have on hand. Check it out. The Book Samaritan is a great organization that has already helped many homeschooling families, and will hopefully help many more in the future. Science: Earth Science using Glencoe Earth Science: Geology, The Environment, and The Universe, AND McDougal Littell Earth Science I bought both used, and I found a high school teacher that posted all his labs online and will choose which of those I’ll use. Physical Education: This will be a variety of physical activities, including local PE classes, swimming and bike riding, and other activities that come up throughout the year. Music: We’re looking into the possibility of drum lessons. Art & Home Skills: Art classes will be here and there as we find things my son likes. We will be going through this book though to do a bit of review and some exposure to artists my son hasn’t studied yet: A Child’s Introduction to Art : The World’s Greatest Paintings and Sculptures . Home Skills will occur through everyday tasks, along with outside classes (he wants to be a chef, so we’re looking into the various opportunities that are available for that), as well as guidance from an e-book we purchased on home skills for boys. **We will no longer be doing grammar, or a formal study of Latin/Greek roots. Well, we’ve reached the end of the year. Seventh grade is over. Now that it’s over I have completed the worksheets for certain books and curriculum, and have a little bit of time to add them here for you guys. So, for now, I’ve added a page for The Critical Thinking Company’s Word Roots B2 book. It includes a basic schedule, as well as all the quizzes I made to go along with the pages of the book. They’re just basic Document files, nothing fancy, but it saves you from having to make them. Hopefully they’ll help someone out there. If your homeschooler (or someone else in your household) is learning a foreign language, these books are a great resource. I stumbled upon these accidentally, and fell in love with the Spanish version immediately. Yes, I have my son learning the language, but I have also taken a considerable amount myself and love the language. I’m not fluent, but wish I was, so I love any awesome resources I come upon. My husband came across this site. How, I have no idea, but I thought I’d share it with others. It might be of interest to someone out there. This site offers Math and Science classes for homeschooled students. There are on-site classes for those in the Atlanta area, and online classes for others. There’s a $15 registration fee and then it’s $58 a month. The class can be spread out for as short or as long as you (or your student) want it to be. There are also textbook and workbook fees, which depend on the class you’re taking. Like I said, I’ve never even heard of this, so, no, we haven’t tried it out, nor have I heard any reviews on it. It never hurts to know about more resources for classes out there, though. Well, it’s that time of year again when we go through a Shakespeare play. So far, in the past couple of years, we’ve done Julius Caesar and Hamlet. I wanted to save Romeo and Juliet for next year, when my son will be in 8th grade, so this year I had to figure out which play to choose. I’m not overly familiar with all of Shakespeare’s works. The only other three I am familiar with myself are A Midsummer Night’s Dream, which I read and saw performed in 7th grade and HATED, Othello, or The Taming of the Shrew, which just didn’t seem like the right choice for an 11-year-old boy. I was looking through various books when I stumbled upon this children’s book on The Stories of Edgar Allan Poe . I love these books by Sterling, and up until now have only bought classic novels in these book formats, so I almost overlooked it. Then the black bird on the front cover caught my eye, reminding me of the poem, “The Raven”, and I thought, Why not? Well, in case someone around here still actually follows anything I write (it’s been a looooooooooooooong time, I know) I thought I’d post this. I found this in my travels today, and really know nothing of it, but it says there’s a FREE Summer Math Program for Grades 1 – High School to keep your children’s skills sharp this summer. If you have time and want to have your kids practice their skills, it might be worth looking into. Supposedly this offer is only good today, so if you’re interested, act fast! It’s called “TenMarks Summer Math Program“. 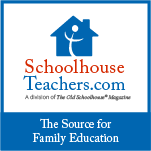 Homeschooling is Fun by Themebuilder | Entries (RSS) and Comments (RSS).